Taken from Wanderlust: 46 Modern Knits for Bohemian Style - "Get your cable on with this offset cable scarf! 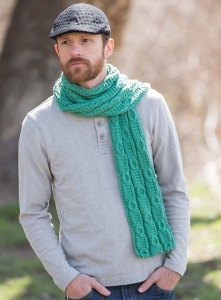 An ideal knit if you're new to cabling or chart reading, this unisex scarf will make you an expert in no time at all." This pattern is from Wanderlust: 46 Modern Knits for Bohemian Style, pg 23 - Drop in the Bucket Scarf. Size US 8 - 16" circular or straight needles (or size needed to obtain gauge), a cable needle, a US H/8 Crochet hook, and a tapestry needle are required but not included. Finished Measurements: About 72.5" long X 5.25" wide after blocking. Gauge: 27.5 sts & 21 rows over 4". Color Shown is #18 Green Spruce.